Did you know that some of the most prized wine grapes in the world are rotten? It’s true. Nestled in the southeast part of California’s Napa Valley lies a vineyard that produces Semillon and Sauvignon Blanc grapes that are never picked until they are purple, shriveled and covered with a fuzzy, grey mold. And the winemaker likes it that way. Sound crazy? Maybe a little, but when conditions are just right, those ugly grapes remarkably transform into one of the world’s most exquisite and rare wines, the late harvest wine known as Dolce. Dolce is the only winery in North America solely devoted to producing a single, late harvest wine. It is made by a natural process occurring in the vineyard, where a beneficial mold called botrytis cinerea attacks the grapes, concentrating sugars, flavors and maintaining acids. Such wines are called “late harvest” because the grapes are left on the vine late into the harvest season, long after dry table wine grapes have been picked, to allow the botrytis to work its magic. The following pages capture the evolution of grapes in the Dolce vineyard during a typical harvest from August through November, along the way to producing the next prized vintage of Dolce. Most winemakers would be delighted to pick such beautiful, clean, healthy fruit from which they would easily make a fine, dry Semillon or Sauvignon Blanc wine. But these grapes have only begun the long and arduous journey to becoming Dolce. Photographed in mid-August, the grapes have gone through veraison, a process in the growth cycle when the berries mature to optimum size, and the colors and flavors deepen and become more complex. While other wineries are preparing to bring in the fruit, Dolce plays the waiting game, hoping botrytis will appear. Making Dolce means taking a huge risk every year because there’s no guarantee that botrytis will take hold in the vineyard. If it does not, the grapes are unable to be used for any other purpose and the harvest becomes a complete loss. In the years when botrytis does develop, natural pests and the appearance of the “wrong” molds lessen the amount of useable fruit. As a result, Dolce lives a “feast or famine” existence, with some vintages producing as few as 300 cases and others as many as 3,000. 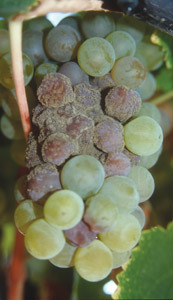 This photograph, taken in mid-September, shows the very early stages of a botrytis infection. Typically, botrytis attacks individual grapes rather than a whole cluster and its approach is never uniform. It also affects grapes at different times during the harvest. 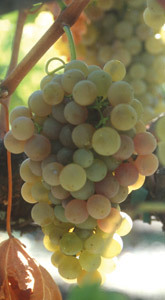 The slight pink hues on some of the grapes in this cluster indicate that botrytis is beginning to take shape. Botrytis thrives on an unusual weather pattern of rain, persistent fog and humidity, followed by drying conditions. When these elements occur at just the right intervals, botrytis grows and often spreads further throughout the vineyard. 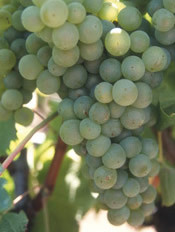 This cluster was photographed in October, and although some of the grapes could be mistaken for a red varietal, this is a cluster of Semillon grapes. The purple grapes show the next phase of botrytis infection, while the green grapes haven’t even been touched by the mold. The shriveled grapes have finished the growth cycle without attracting botrytis and will not be picked. By the end of October most red varietals have been harvested, but in true Dolce fashion, these grapes are about only two-thirds of the way through the ripening process. 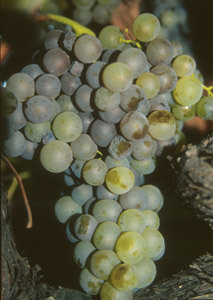 Botrytis is vigorously infecting the grapes in the center of the cluster and the mold’s spores are clearly visible. A few of the berries at the top are showing an earlier stage of infection. The Dolce vineyard’s average yield is four to five tons of grapes per acre, and all of that would be harvested if the grapes were picked to produce a dry table wine. However, because of the nature of botrytis and the random, unpredictable way it attacks the grapes, the average amount that is actually harvested from the Dolce vineyard is usually about one ton per acre. A dramatically smaller amount of wine can be made from one ton of grapes, than from five tons, underscoring the rarity of Dolce. This cluster perfectly illustrates the losses regularly experienced in the Dolce vineyard. Photographed in November, the grapes on the lower portion of the cluster are almost perfectly botrytised, and will soon be picked. The others are so green, it is unlikely that the remaining grapes will develop botrytis, and it is far too late in the season for them to be harvested for another use. “Yuck!” would be a natural reaction to this moldy cluster, but believe it or not, these are the grapes Dolce hopes for every year. Perfectly botrytised, covered with spores, purple and shriveled on the outside, these grapes contain the most sweet, concentrated, ethereal juice imaginable. Pictured in mid-November, the botrytised grapes are finally ready. Dolce is always picked by hand, and often only individual berries or partial clusters are harvested. The rest of the grapes are left on the vine. Numerous picking passes take place in the vineyard over a period of several weeks, usually beginning the second half of October and extending through Thanksgiving or later, as the grapes are ready at different times.